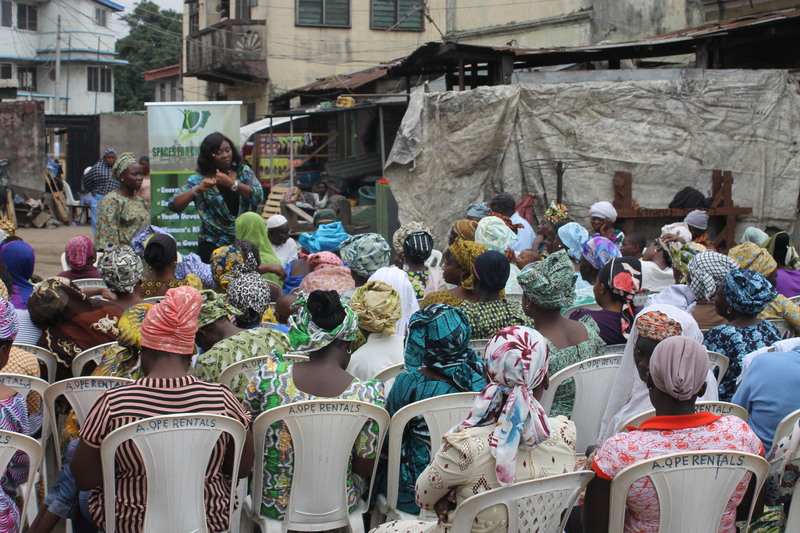 Photos from the Women-Kitchen-Energy Forum held at Ebutte Metta, Lagos, on September 5, 2015. 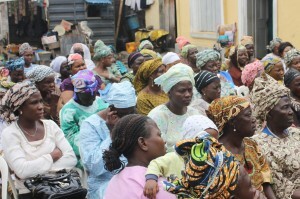 The September edition of the Women-Kitchen-Energy Forum was held in Ebutte Metta in Lagos Mainland Area. 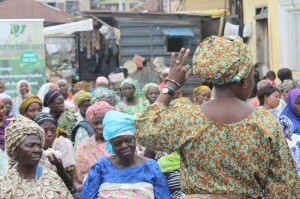 Ebutte Metta is host to several slum and informal settlements predominantly inhabited by the urban poor. Convened once every month under the auspices of Spaces for Change’s Gender and Energy Policy Research Campaign, the forum brought together 89 persons, 77 of whom are women from low-income households in communities within the Lagos Mainland area. Through this double-edged policy research campaign, Spaces for Change is generating data on women’s budget shares for traditional cooking fuels, with a view to understanding the income effects of subsidy reform on gender, and the potentials that exist for fuel-switching to cleaner energy sources for cooking and other domestic uses. The monthly interactions with low-income women allow us to extract a wide range of potential lessons for future reformers. On the other hand, S4C is providing well-researched, evidence-based information that can enable the poor and low-income women make informed choices about cooking fuels they use in their homes and businesses. 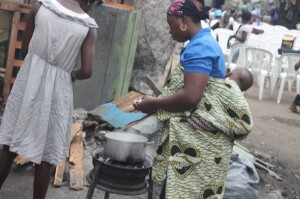 One major finding from the forum is that majority of low-income women use kerosene stoves to cook, followed by charcoal, firewood, sawdust and then cooking gas, also known as liquefied petroleum gas (LPG). Some of them have also used electric stoves at one time or the other. Energy poverty is rife in these neighbourhoods. They decried the fact that fuel stations across Lagos State has since stopped dispensing kerosene at the official pump price of N50 per litre. So, these low-income women that largely depend on kerosene for their energy needs buy the 75cl bottle of kerosene at N200 per bottle, N400 for the 150cl bottle and N1,900 for the 4 litre jerrycan which ordinarily should cost N200. Most of them consume an average of 4-litre jerrycan every week, and spend about 7,600 monthly on kerosene alone. As at November 2013, official records affirm that the Federal Government has spent N634bn to subsidize the retail price of kerosene in the past three years: N110bn was spent in 2010, N324bn in 2011 and N200bn in 2012, totaling N634bn in three years. By January 2014, the subsidy sum spent on petroleum products, including kerosene subsidy between 2012 and 2013 jumped to N1.3 Trillion ($8.49bn). As evidence from the forum demonstrates, the poor and the low-income rarely benefit from kerosene subsidy. Another key finding is that women bear the brunt of energy poverty. 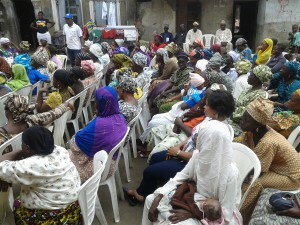 Out of the 77 women that participated in the event, 49 are heads of their households. 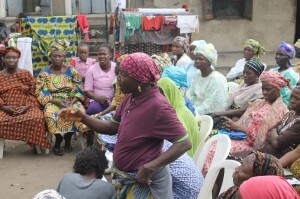 Women-headed households have been defined as households which may contain men, but within which women bear the primary economic responsibility for the provision of basic family needs. This therefore means that these women are the primary decision-makers of the kinds of cooking fuels most suited to their economic realities. The contributions from the women counters the standard theory of household energy transition which posits that low-income households gradually ascend an energy ladder which goes from traditional biomass to cleaner cooking fuels such as LPG and terminates with electricity and solar energy. 38 out of 77 women stated that their choice of fuel depend on factors such as the size of the cooking to be done, location, accessibility of cooking fuel type, efficiency of the cooking fuel (how fast and hot it burns) and then the cost of the fuel. An independent study, ‘Multiple Fuel Use Approach’ in Rural Mexican Households, Masera et al. (2000) concluded that “rural households do not ‘switch’ fuels, but more generally follow a multiple fuel or ‘fuel stacking’ strategy in which new cooking technologies and fuels are added, but even the most traditional systems are rarely abandoned.” This appears to be true of the women in Ebutte Metta. Accordingly, 30 of the women say they use a combination of different cooking fuels at the same. When asked if they were open to accepting new and cleaner cooking alternatives, the women in the ratio 31:29:16, said they would consider LPG, kerosene and electric stoves respectively. “Assuming you had the resources, or the government subsidized LPG, would you consider switching to LPG immediately?” The women expressed deep fears and concerns about using LPG most of which bother on accessibility and safety. 60 of them thought that LPG and electric stoves are not suitable for households with small kids because of the extreme caution involved. However, there was consensus among the women that the use of LPG is no longer considered a luxury as there are smaller retail sizes. Only 10 of the women had seen ethanol (green cook) stoves and only 1 person had used the product before. Spaces for Change’s gender and policy research campaign is documenting these important lessons as they’d inform policy reform proposals in the energy sector. Improved analysis of the household choice of cooking fuels and stoves also helps to build the evidence for switching to cleaner fuels, and for influencing interventions designed to address the health, socioeconomic and environmental impacts of the energy sector. 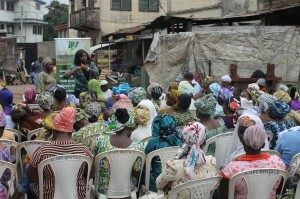 The forum was organized in collaboration with the Rural-Urban Development Initiative (RUDI). Thank you for your work to promote a Safe and Cleaner Kitchen in Nigeria.